Activating Village Courts in Bangladesh Phase II (AVCB II) Project facilitates local authorities in making village courts functional at 1,080 unions with financial supports and a tri-partnership with European Union (EU), United Nations Development Programme (UNDP) and the Government of Bangladesh. The Local Government Division (LGD) of the Ministry of Local Government, Rural Development and Cooperatives (MoLGRD&C) is implementing this project for creating wider access to dispute resolutions services for the rural people particularly poor and vulnerable at the community level. Following successful implementation of a Pilot Phase (2009 – 2015), AVCB II Project has been scaled up to 27 districts covering eight administrative divisions. The overarching objective of the AVCB II project is to contribute to improve the access to justice for disadvantaged and marginalized groups in Bangladesh. To empower local people, especially women, the poor and vulnerable groups to seek remedies for injustices and to resolve their disputes at the local level in an expeditious, transparent and affordable manner. 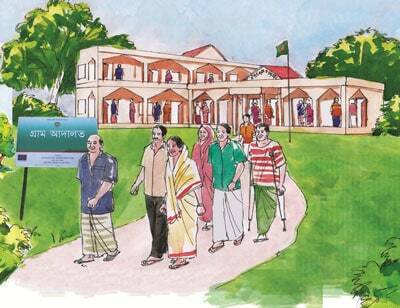 27 Districts and 128 Upazilas Village Courts Management Committees (VCMCs) have been formed and are functioning.